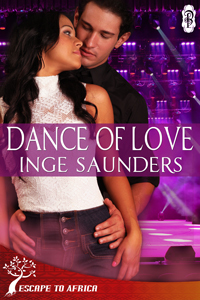 Dance of Love by Inge Saunders is a short, fun and flirty read. The author paints a convincing tale as she introduces her characters whose depth and emotions are so raw and relatable you feel it! Ashley's passion for achieving her goals, to finding true happiness no matter what obstacles stand in her way I find sincere. And her determination, her grit and her passion to make her dreams become a reality compliments and enhances the plot. The hero is likable and sincere. He is true to his beliefs and stands by his decisions with a strong sense of thoughtfulness and determination one just has to respect. At the end of the day I'd say Dance of Love is a remarkable story of life, love and chasing dreams, teaching us to never give up on things our heart sets out to achieve but rather to put our best foot forward until we win the battle of fulfillment in the end. All roads lead to Rome when Ashley Solomons embarks on fulfilling her dream to become a world-class dancer. But there’s one person who stands in her way. “It`s a no from me,” Antonio Machiavelli. When Antonio’s auditions for a lead principal end in wintry Cape Town, the last thing he expects is to have more than a knee-jerk reaction to an audition. Ashley not only verbally challenges him, but also translates her fire and cheekiness into an edge of your seat performance. Can Antonio keep his distance from Ashley? Can Ashley focus on fulfilling her dream of becoming a lead principal? Or will love have its way? He let the girl get to the chorus before dismissing her as well. The other panel members spoke kindly, and she didn’t leave in tears as the candidate before her had. Before he could call next, she walked out on stage. She didn’t stand a chance in hell, so why give him the satisfaction of ordering her around? Finding her center, she met the eyes of the panel and blinked. Maybe she should have Googled Antonio Machiavelli, she mused standing transfixed. He was much younger than she expected and more attractive. He appeared to be in his early thirties, with a mop of dark curls falling across his forehead. Even seated, he towered over the other judges. No wonder every girl’s unnerved. He`s intimidating with his tanned hands folded in front of him on the table.. His grim scowl reminded her to not cave. “What’s your name?” the lone woman on the panel asked with a kind smile. That got his attention. She couldn’t see the color of his eyes, but if she had to guess, she’d say fiery red. He sat forward in his chair, leaning over the table, dwarfing it. He had the persona of an angry wolf out to devour her. The thought set her heart racing. What? She watched too much True Blood. Inge Saunders fell in love with books when she started reading romance novels with her grandmother. Intrigued by the worlds books unlocked, it was inevitable she would take pen to paper. She forms part of Romance writers’ Organization of South Africa (ROSA) and currently has two books out with Decadent Publishing; Falling for Mr. Unexpected and her latest release Dance of Love. Happy Release Day to Me! We-e-e-e!